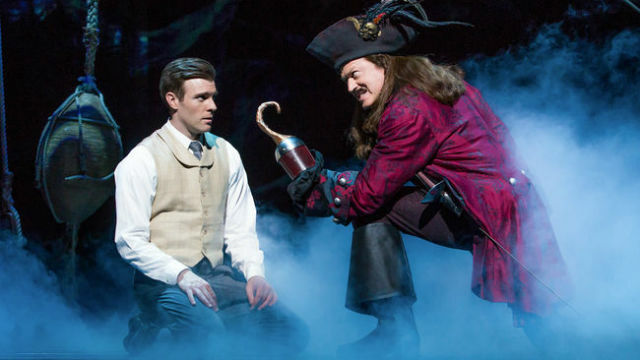 A scene from “Finding Neverland” by Broadway San Diego and the Civic Theatre. Admit it. Once or twice in your life (in childhood? this morning?) you’ve had a Peter Pan fantasy: no responsibilities, no obligations, no growing up. Whatta life, right? J.M. Barrie’s most famous creation remains, after 111 years, endlessly, eternally intriguing. The 2004 film, starring Johnny Depp as Barrie, explored the backstory and impetus for the invention of the irresistible character. And in 2012, “Finding Neverland” became a musical based on the movie, and premiered on Broadway, directed by Tony Award-winner Diane Paulus. Now, the national touring production (under Paulus’ guidance) has alighted in San Diego — its first local visit — and an elaborate affair it is. The scenic design and set changes, the lighting, sound, projections and special effects are superb. Real theater magic is made repeatedly, by director Diane Paulus and her creative team. But the first act is frenetic, almost frantic, with stage business — which seems to be intended to mask a dull book and uninspired score. We meet the famous playwright, James Barrie (Billy Harrington Tighe)and his demanding producer, Charles Frohman (marvelous Tom Hewitt, who later morphs into a deliciously devious Captain Hook), as well as Sylvia Llewelyn Davies (Christin Dwyer) and her four young sons (played by talented actors ranging in age from 9 to 12). The chorus works overtime, with dancing, rope-hanging, acrobatic moves and all manner of histrionics (some characters are played way over the top). Barrie is in a rut; his current play isn’t doing well, Frohman is going broke, and he must complete a new hit play ASAP. As soon as Barrie meets the Llewelyn Davies family, his inner child is unleashed. He bonds with the boys (whose father died a year ago) and falls for their mother (though not for their nasty, supercilious grandmother, who will become the inspiration for the Crocodile). The games they play — even their names (Peter and Michael) inspire “Peter Pan,” which does, in fact, become an instant hit; Barrie brings orphans into the opening night audience and they spark the rapturous response to the production. (Ultimately, Barrie donated all his earnings to a London orphanage). By the end of the play, the four boys are orphans, too — but Barrie and their grandma share child-rearing responsibilities, at Sylvia’s request. (Barrie’s uptight wife has already left him by this time). There’s a lot more to connect with in the second act, and more energetic numbers, including “The World is Upside Down,” “Play” and “Something About this Night.” To be fair, the first-act song “Circus of Your Mind” is pretty entertaining, too. The problem is that Barrie himself isn’t a very interesting character; nor is Sylvia. Tighe is a fine singer and agile performer. He’s most likely playing the role just the way Matthew Morrison did on Broadway. But this James Barrie (and perhaps the real one) just is not that engaging or charismatic. In the film, Johnny Depp made him a delightfully quirky character, with a whimsical sense of humor. There’s little of that here. The two leads feel very tamped down. The score (by Gary Barlow & Eliot Kennedy) rarely advances character or action, and isn’t very memorable. The eight-piece orchestra doesn’t make much of a splash. The book (James Graham) takes a long time to get going. But the story itself, based in fact, is compelling and seductive. And it reminds us to get back to our own sense of play, imagination and youthful wonder. When Sylvia succumbs to what is most likely tuberculosis, it’s hard to maintain your composure. Her demise and departure (for Neverland, natch) comprise the most eye-popping, magical scene in the show. Pixie dust! A floating shawl! Talk about your dramatic exits. The show’s message, and the many theater in-jokes and sly sarcasms, make this a musical geared toward adults. But the numerous young people in the audience seemed to be loving it, too. And why not? There’s almost constant, swirling, kinetic change and action — and kids — involved. “Finding Neverland” may be a flawed piece of work, but there’s a lot to like about this elaborate production — especially if you believe in fairies (“Darling,” says one limp-wristed actor when asked, “I work in the theatuh. I see them every day!”). Performances are Thursday-Saturday at 7:30 p.m., Sunday at 6:30 p.m., with matinees on Saturday at 2 p.m. and Sunday at 1 p.m.